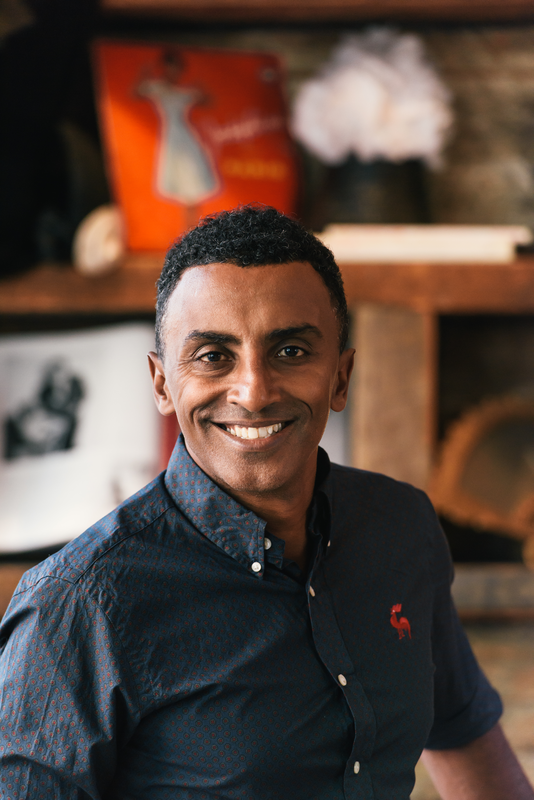 Celebrity chef Marcus Samuelsson has teamed up with MGM Resorts International to open his first restaurant in Washington, D.C., at the MGM National Harbor, which opened in Oxon Hill, Md., in December. The restaurant, named Marcus, is open from 6 a.m. to 2 a.m., and provides 24-hour in-room dining at the 308-room hotel, as well as breakfast, lunch and dinner service in an 84-seat dining room and 21-seat bar, all overseen on a day-to-day basis by executive chef David Sears. Samuelsson, who is based in New York and was raised in Sweden, recently discussed imbuing the new project with local flavor. At Red Rooster, your restaurant in New York City, you feature African-American comfort food with upscale flourishes. Are you doing something similar here? A lot of our food [at Red Rooster] is inspired by migration, looking at the food of the African-American culture coming up north. Being here [in the Washington, D.C., area], where you’re really at a crossroads between north and south, is fascinating. How is that borne out in the food? We have a rice dish topped with catfish. The original inspiration came from a Senegalese dish called thiebou djenne. That’s also a fish dish with rice, right? Exactly. So that’s where we started — rice with no sauce, the sauce is the rice [the flavoring is incorporated into the rice]. Cooking it slightly longer, and adding a crunch into it. Then, we used tomato and coconut milk, which adds a je ne sais quoi that’s both sweet and nutty. Then, adding a little bit citrus, not too much. And then, a spice blend on the catfish that gives you a steak feel. That’s where the char comes in. How do you make catfish feel like steak? What’s in the spice blend? A little bit of file [sassafras herb used in Cajun gumbo], a little berbere, smoked paprika, celery salt and garlic powder. So it’s inspired by New Orleans; it has a Cajun feel to that. It’s delicious and comfortable at the same time. You can eat it with a fork, you can eat it with a spoon, and it’s just delicious. But then there’s also berbere, which is not Cajun at all. It’s Ethiopian. Exactly. I’ve come [from New York] to DC for real Ethiopian food many, many times and I really look forward to that. And here [unlike in New York] I don’t have to struggle to find berbere or teff. We also use injera [an Ethiopian flat bread made from teff flour] and fermented butter here. We have at least five Ethiopian ingredients here that are better than New York. Do you think of that as local influence, since DC has such a dynamic Ethiopian community? Absolutely. And the Ethiopian community is part of the staff, they’re part of the customer [base], and they get so excited when they say, “Oh, I think there’s Berbere in the drink!” Yes, there is. Does the staff have a role in developing the menu? We have some Peruvian staff in the kitchen, and they’ve had some influence on our poke dish, which is about half ceviche. We didn’t put aji amarillo or leche de tigre [ingredients in many Peruvian ceviches] in it because then the dish goes in a different direction, but it’s not a poke from Hawaii and the staff did a lot to help me develop it. Having a mixed staff that is local is very helpful. For example, we developed a crab dip. We knew we wanted to put crab on the menu, but we didn’t want to do crab cakes because there are enough places doing crab cakes around here. But I asked the staff, what do you love about a crab cake? And each one can break down what a crab cake should taste like. So, I asked, what can we mirror from that in the crab dip. Because I grew up with seafood, but I didn’t grow up with crab cakes. Mustard greens and seaweed on the bottom. Then, a little soy, lemon juice, and then really crispy rice to coat the salmon. It’s rice that was cooked the day before and you let it sit so it gets a little coating on it. Then, you toast it in the oven, so it has a bite, and then it’s soft in the middle. That’s not in normal poke or ceviche, that’s just a texture that I enjoy. Then it’s a bunch of raw stuff — radish, jalapeño, onion — for texture. How about the crab dip? A lot of things that a crab cake would have, but we heat it up in the salamander. We finish it with pickled banana chiles. Most crab cakes don’t have that, but underneath that you have a little bit of mustard and a little bit of garlic. I choose to add a little bit of cornichons, a little bit of mayo, and then we just blast it in the salamander and it [the mayonnaise] breaks. Then, we serve it with toasted baguette right next to it. When you spread it, that bite is delicious, with the crunch, and the richness of the crab. Correction Feb. 6: A previous version of this story misstated the operating hours of Marcus, which is 6 a.m. to 2 a.m.